Homepage. 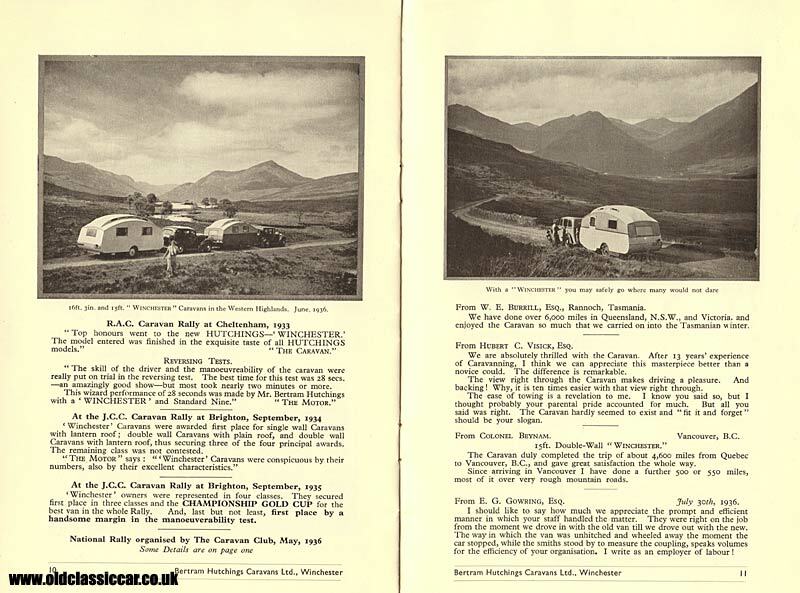 This page: A further set of scans from original, pre-war, caravan literature. 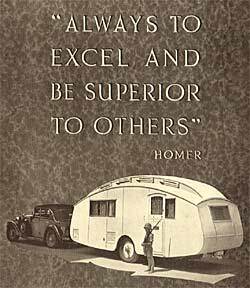 Bertram Hutchings Caravans Ltd, makers of the Winchester caravans, were aiming their products at the well-to-do end of the market, judging by the motorcars shown towing these quality caravans - the motto 'Always To Excel And Be Superior To Others' (Homer) tends to back this up. All the thumbnails below are clickable, bringing up a larger version of each scan. If you have any old brochures that you'd be willing to scan and submit to this section, please get in touch! 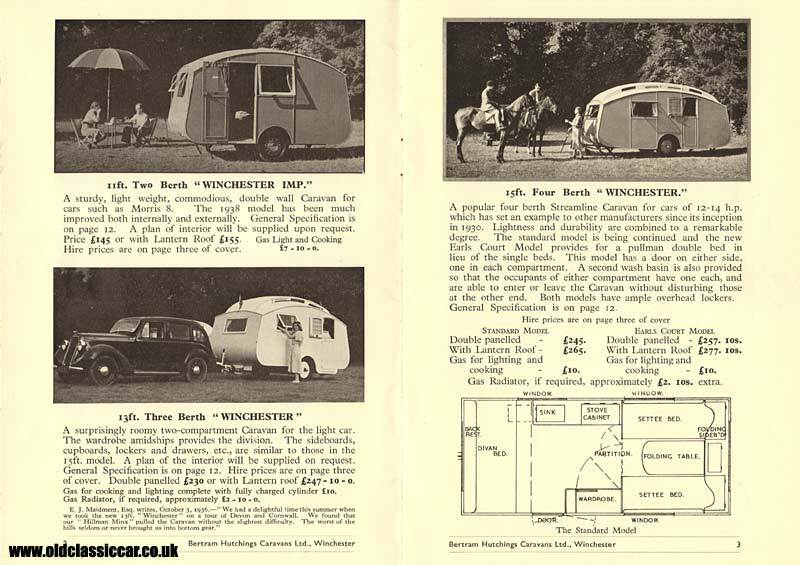 "Winchester Caravans are not made 'on a line' in a mass production factory, but possess a sense of breeding and pedigree only to be found where a love of craftsmanship is fostered. This exclusiveness is borne out by the fact that 'WINCHESTER' Caravans have secured the majority of awards for two-wheel Trailer Caravans in open competitions and rallies. At the Caravan Club National Rally at Leamington Spa, May 1936, with an attendance of 104 vans, 'Winchester' Caravans secured awards in every one of the thirteen feature Classes. This record was not approached by any other make. 'Winchester' owners also secured First Place in each of the two Skilful Driving Tests." 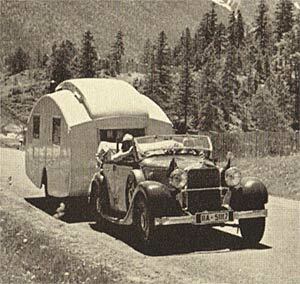 The various caravans in their late 1930s range. The brochure starts out describing the more affordable end of their range. This starts with the 11ft two berth Winchester Imp, a smaller, double wall, caravan, designed to be towed behind such leviathons as the Morris 8 saloon. The purchase price for the Imp was £145, or £155 with a lantern roof fitted. Gas lighting and cooking facilities would be an extra £7-10-0. 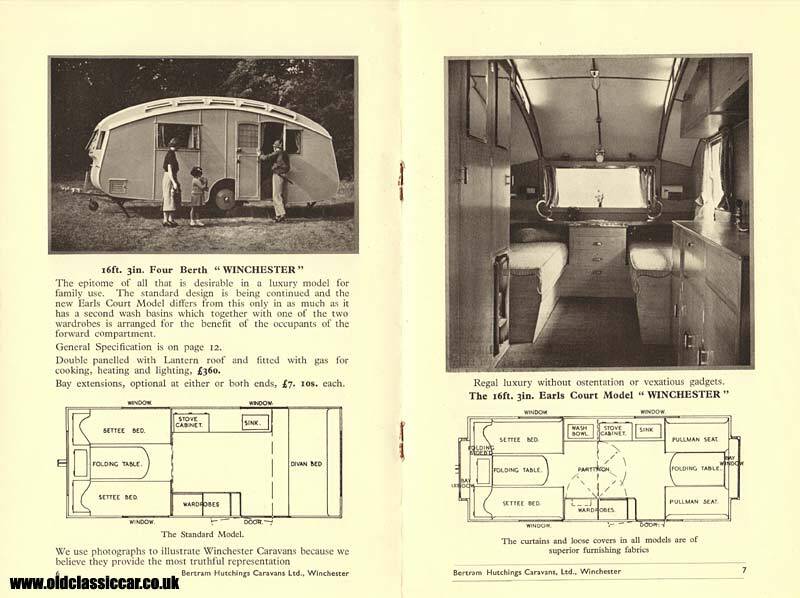 For those with slightly deeper pockets, and a motor-car more blessed in performance, there was the three berth Winchester, "a surprisingly roomy two-compartment caravan for the light car". There is also a personal recommendation from a happy user of just such a van: "E.J. Maidment Esq. writes, October 3, 1936, 'We had a delightful time this summer when we took the new 13ft 'Winchester' on a tour of Devon and Cornwall. We found that our 'Hillman Minx' pulled the caravan without the slightest difficulty. The worst of the hills seldom or never brought us into bottom gear'". 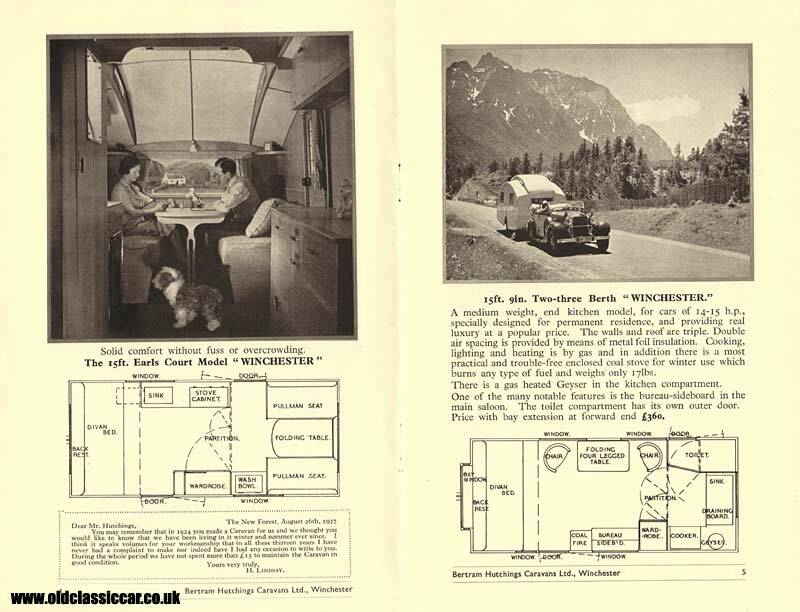 The family man needing a little more interior space could, for just £245, opt for the 15ft version of the Winchester, "a popular four berth Streamline Caravan for cars of 12-14hp, which has set an example to other manufacturers since its inception in 1930". Two versions were on offer, the standard model, and the Earls Court Model, which offered a pullman double bed in lieu of single beds, and also a door fitted to either side and a second wash basin. 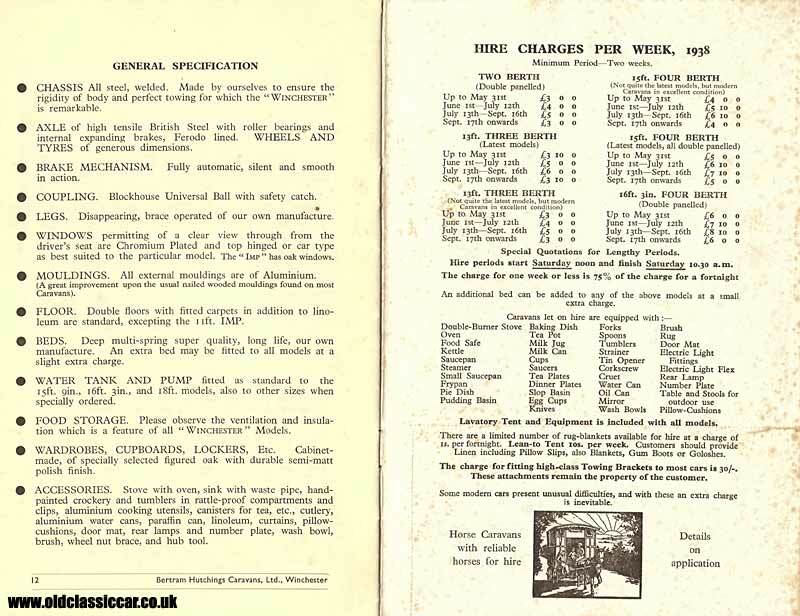 If you planned to live in your touring caravan, and had a motorcar of 14-15hp, then the 15ft 9in Two-Three Berth was the 'van for you - "specially designed for permanent residence, and providing real luxury at a popular price. The walls and roof are triple. Double air spacing is provided by means of metal foil insulation". Gas provided the fuel for cooking, lighting and heating, the latter supplemented by the handy inclusion of an enclosed coal stove for winter use. Next up in the size stakes was the 16ft 3in four berth variant, "the epitome of all that is desirable in a luxury model for family use". Again this could be ordered in standard, or Earls Court version. 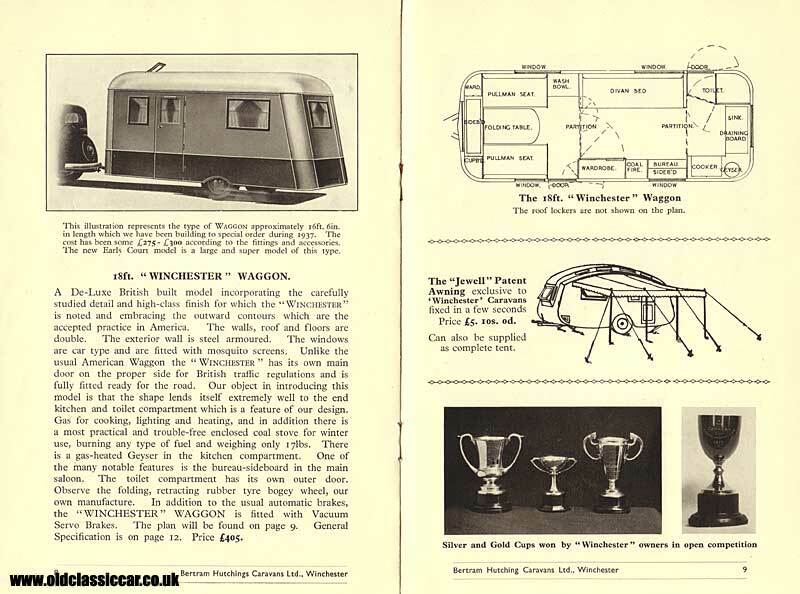 A real oddball is the 18ft long "Winchester Waggon", a caravan that lends its styling to the US way of thinking. The exterior wall was steel armoured, and windows fitted with mosquito screens, "unlike the usual American Waggon the Winchester has its own main door on the proper side for British traffic regulations and is full fitted ready for the road". As with the 15ft 9in caravans, the Waggon came with an extra coal powered stove for extra heating, and "observe the folding, retracting rubber tyre bogey wheel, our own manufacture. In addition to the usual automatic brakes, the Winchester Waggon is fitted with Vacuum Servo brakes". The price? £405 to you Sir. Recommendations and plaudits from happy caravanners. The final two inside pages outline the General Specification of all their caravans, and details on how you could hire a 'van direct from the Works. If you didn't own a motor-car, you could always opt for "Horse Caravans - with reliable horses for hire".